Recent trends i n home ownership have shown a shift from coexistence with our pets toward inclusion of them into our family. The result of this shift is that owners are increasingly considering their pets in the functionality and design of their homes. According to the American Pet Products Association, 65% of Americans now own pets and in 2013 spent $55 Billion on their furkids. The National Association of Realtors reported that 5,090,429 new and existing homes were sold in 2013. The number of pet owning Americans and the number of home buying Americans likely overlap quite a bit. One way this convergence has manifested itself in real estate is through pet friendly amenities offered by home builders and the growing popularity of Dog Runs and Catteries we see in homes for sale. One builder, Standard Pacific Homes, has taken the idea of pet amenities to the next level with some added luxuries. One floorplan offers an optional 170 sqft “pet suite” including a Cabinet with a Pet Bed, Desk with Recycle Bin, Pet Shower with (2) Hand Held Faucet Fixtures (one of the top requested items in the homes of pet parents is a separate dog washing station), Plumbing Fixtures for Pet Water and a Cultured Marble Countertop to top it off. The price tag for this top of the line pet suite? Add $30,720 to the price of your home. Basic Catteries & Dog runs are two more common pet amenities that have been trending in very recent years. Designs range from budget friendly to elaborate (and expensive). More than just an exercise or leisure space for your pets, having separate pet areas such as catteries or dog runs have added benefits for selling as well: You could be attracting pet-loving homebuyers, you are protecting and making your pets feel safe while strangers tour your home and it creates a better home tour when pets are not distracting buyers. Dog runs can actually be a beneficial feature for your home as they tend to keep the grass in most of your yard alive because there is a sectioned off area of the yard that bears the majority of the impact from your dog. 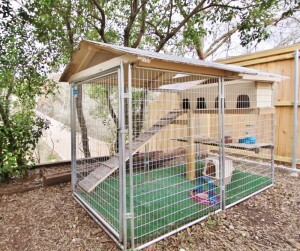 Catteries are large outdoor enclosures for cats that allow them the sights and scents of outside with the safety of an enclosed space. I had a cattery custom built using the frame of a large steel kennel for under $600. Pet folks now not only consider how a home works for them, but how it works for their pets. Whether you are interested in a $30k pet suite or a simple cattery or dog run, the rising trend of pet inclusive lifestyles informs us that pet amenities aren’t likely to deter Buyers. They may even be the pivotal feature for your home for those pet-parent buyers. The popularity of including our furkids in our everyday lives will likely not diminish, so we can only look forward to more pet-inclusive homes in the real estate market place.